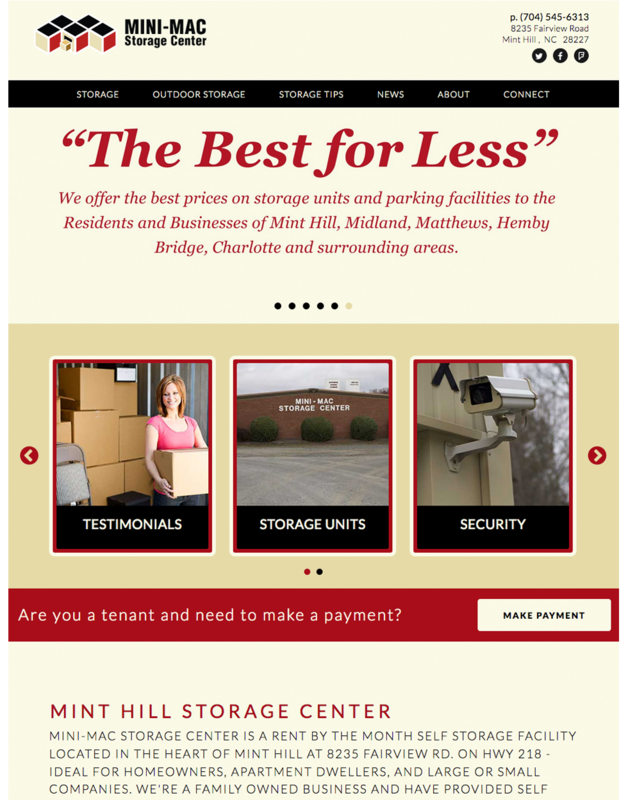 Mini-Mac Storage Center called on us after reviewing a marketing campaign featuring a website we had built for another client. I guess they liked what they saw and what we had to say, because they hired us the same day we met. Within hours of arriving back at our shop I sent some information to Mini-Mac to discover more about their business and shed more light on their goals, who their targeted audience was and other topics related to their business industry. The first task on our plate was to design a new logo for Mini-Mac Storage Center and establish a color scheme. After working up some draft logo concepts, we settled on a few we wanted to show and began to render them as vector illustrations and presented them for review. With the logo chosen, we asked them to start gather testimonials from their clients and we got right into designing their new website and shortly afterwards provided draft concepts for review. The previous Mini-Mac Storage Center website had little to no content other than a brief three sentence description, phone number and a contact form. Considering the lack of content that actually existed on their previous website, we knew we'd have to devote some time to helping them develop new content for their website, research their competition and develop the right message to help them perform well in search engine results. We also performed a photo shoot to capture some quality images of their facilities for use on the website we where developing. To give the site more visual impact we added a slide show and created wire-frame art elements depicting the storage units filled with person items within the units. We also set up their social networks and applied their logo / branding, and developed a news and storage tips section to their website so they could develop more keyword rich content in the months and years to come. Once the site was wrapped up and live, it was exciting to watch this small family owned website climb the ranks of Google and perform just as well and/or out perform those large corporate giants and their marketing dollars. Proof enough that well written web code, a good website message and best practices in web development does produce solid results. Mike, I wanted to drop a quick note and tell you what a wonderful job Kaleidoscope Inc. did on developing our Mini Mac Storage website. Your company is very prompt and thorough and a joy to work with. Mike you went over and beyond to help get everything just right on our website. Thanks for making Mini Mac Storage going live such a success. 7427 Matthews Mint Hill Rd.